Oiling the head is one of the most beautiful ways to enhance life in all ways. Memory, intelligence, concentration, vitality and vigour are all increased with regular head massage. The head should always be cooled and thus most Ayurvedic head and hair oils are coconut based with coconut oil being a soothing and cooling base. The most famous are Mahabhringaraj and Neelibhringadi oil. If used regularly they can turn grey hair to black and reawaken a sluggish mind. They are superb for insomnia and mental restlessness. Baidyanath Mahabhringraj Oil is prepared scientifically from pure invaluable herbs in refined till oil as per the recognized Ayurvedic Text. It is highly effective and excellent remedy for falling hair, premature graying, sleeplessness & head ache. Regular use prevents falling hair, Dandruff & keeps brain cool. Lippu Oil is a perfect solution to the problems of Dry skin, hyper melanosis, Lichen Planus, Ichthyosis, and Eczema. It offers quick recovery by control of itching, lichenisation and preventing further damage to the epidermis. Brahmi, Juice of Amala, Til Oil. Brahmi Amala Oil: Amala nourishes hair from root and makes it strong and healthy. Brahmi helsp to calm the mind and brings mental relaxation. It is prepared in a base of pure sesame oil which is a good source of vitamin A, E and other vital nutrients that makes hair healthy and lustrous. Badam tail, Jaitun tail, Akhrot tail,Surajmukhi tail, Til tail, Soyabean tail, Moongfuli tail, Sarson tail,Erand tail. Useful for hair and skin glow and improves muscle strength. Usage: 10 - 15 ml Tejus Tailum to be massaged all over the body for desired results 1-2 times a day. It relieves headache caused due to intensity of heat. It induces sleep and has a soothing effect on brain. Brahmi, Bhringraj, Mehandi, Mahamohi, Shikakai, Methi Beej, Triphala, Neem, Nagar Motha, Kapoor Kachar, Indrayan, Nag Kesar, Sphatika, Aloevera, Lemon juice, Coconut Oil, Almond Oil, Til Tail. 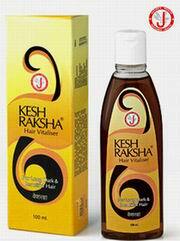 An Excellent hair treatment oil to stop Hair Fall, Dandruff, Prevents premature greying of hair. Keeps hair black, longer and healthy. Roghan Kunjad, Amla, Mazoophal, Halela Siyah, Coconut Oil. It checks falling of hair. It helps in growth and nourishing of hair roots. It also imparts cooling effect to the head. Massage gently over the head for few minutes 1-2 times a day. Packing: 100 ml glass bottle. Helianthus annus 760 mg, Olea europaea 60 mg, Sesamum indicum 60 mg, Emblica officinalis 60 mg. It helps to strengthen the hair roots, prevents hair fall, graying of hair and split ends. Take required quantity of oil and massage gently over hair and scalp. Leave for half an hour before washing. Ingredients: Amla, Shikakai, Mehndi, Reetha, Bhringraj, Nimbu Satava, Chandan, Brahmi, Sugandhit Dravya. An unique ayurvedic formulation to combat all types of hair problems viz greying of hair, dandruff, thinning of hair. It enriches hair deep within and prevents hair loss. Henna, Jojoba Oil, Rosemary, Lavender. Benefits: It is a unique cleansing tonic which helps to stimulate new hair growth and prevents hair fall. It helps to prevent from environmental damage, soothes scalp and adds volume to the hair. Use as a regular shampoo. Wet hair, apply shampoo and lather, rinse after a minute. It is an excellent medicated hair tonic for dry hair. It keeps hair clean, glossy, smooth and extraordinary soft. Apply sufficient quantity into the scalp, rub gently for 10 – 15 minutes. If needed, cleanse hair with shampoo after 1- 2 hours. Hairbac oil helps in promoting strong, beutiful and healthy hair. Usage: Apply oil on hair and scalp with gentle massage. Very good medicine for cough and cold, very much satisfied ..